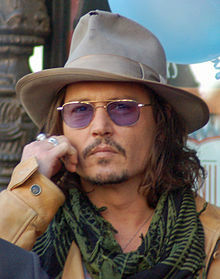 John Christopher Depp II (born June 9, 1963) is an American actor, producer and musician. He has been nominated for ten Golden Globe Awards, winning one for Best Actor for his performance of the title role in Sweeney Todd: The Demon Barber of Fleet Street (2008) and has been nominated for three Academy Awards for Best Actor, among other accolades. 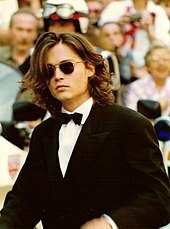 Depp rose to prominence on the 1980s television series 21 Jump Street, becoming a teen idol. He is regarded as one of the world's biggest film stars. He has gained praise from reviewers for his portrayals of screenwriter-director Ed Wood in Ed Wood, undercover FBI agent Joseph D. Pistone in Donnie Brasco, author J. M. Barrie in Finding Neverland, and Boston gangster Whitey Bulger in Black Mass. Depp is the third highest-grossing actor worldwide, as films featuring Depp have grossed over US$3.7 billion at the United States box office and over US$10 billion worldwide. He has been listed in the 2012 Guinness World Records as the world's highest-paid actor, with earnings of US$75 million. His most commercially successful films are the Pirates of the Caribbean series, which grossed US$4.5 billion, the Fantastic Beasts film series, which grossed US$1.3 billion, Alice in Wonderland, which grossed US$1 billion, Charlie and the Chocolate Factory, which grossed US$474 million, and The Tourist, which grossed US$278 million. Depp was born in Owensboro, Kentucky, the youngest of four children of Betty Sue Palmer (née Wells), a waitress, and John Christopher Depp, a civil engineer. Depp is of mostly English ancestry, with some Dutch, Belgian, and French. He is descended from a French Huguenot immigrant (Pierre Dieppe, who settled in Virginia around 1700) and from colonial freedom fighter Elizabeth Key Grinstead (1630-1665), daughter of a British nobleman and an indentured African woman. Depp moved frequently during his childhood. He and his siblings lived in more than 20 different places, eventually settling in Miramar, Florida in 1970. Depp's parents divorced in 1978 when he was 15. His mother married Robert Palmer, whom Depp has called "an inspiration to me." In 2016, Depp played businessman and United States presidential candidate Donald Trump in a Funny or Die satire film entitled Donald Trump's The Art of the Deal: The Movie. He earned praise for the role, with a headline from The A.V. Club declaring "Who knew Donald Trump was the comeback role Johnny Depp needed?" The same year, Depp reprised the role of the Mad Hatter in Alice Through the Looking Glass, the sequel to Alice in Wonderland. Depp was secretly cast to play Gellert Grindelwald in a cameo appearance in the 2016 film Fantastic Beasts and Where to Find Them, a role he is expected to reprise in all future sequels. Grindelwald is a dark wizard who once shared a close relationship with Albus Dumbledore, a major character in the Harry Potter film series. In November 2016, Depp teamed with David Lynch, JK Simmons, Laura Dern, Penelope Ann Miller, Chad Coleman, Richard Chamberlain, Catherine Hardwicke, Theodore Melfi, Sam Raimi, Peter Farrelly, and the non-profit Make A Film Foundation for a volunteer project entitled The Black Ghiandola, a short film written by Anthony Conti. The movie is "a story about a young man risking his life to save a young girl he has grown to love, after his family has been killed in the Apocalyptic world of Zombies." The film was released in April 2017. Depp reprised his role as Captain Jack Sparrow in the 2017 sequel Pirates of the Caribbean: Dead Men Tell No Tales, the fifth film in the series. The film was directed by Joachim Rønning and Espen Sandberg, and co-starred Javier Bardem (as Captain Salazar), Geoffrey Rush, Brenton Thwaites, Kaya Scodelario, and Orlando Bloom (returning as Will Turner). Depp co-starred in the mystery drama Murder on the Orient Express (2017), as Edward Ratchett. Principal photography began in November 2016 in the United Kingdom. Kenneth Branagh directed the film, an adaptation of the classic novel of the same name by Agatha Christie, and also played detective Hercule Poirot. In February 2016, it was announced that Depp had been cast as Dr. Jack Griffin / The Invisible Man in Universal Studios' upcoming shared film universe entitled the Dark Universe, a rebooted version of their classic Universal Monsters franchise. Depp is slated to portray the character throughout the series' installments, as well as in the as-of-yet untitled Invisible Man film that is intended to be a reboot of the 1933 film The Invisible Man. After the first film set in the Dark Universe The Mummy received generally negative reviews from critics and performed below the studio's expectations at the box office, producers Alex Kurtzman and Chris Morgan left the franchise. As a result Universal put a hold on future projects while they create a plan for future releases. In 2015, Depp formed the supergroup Hollywood Vampires with Alice Cooper and Joe Perry. They released their self-titled debut studio album on September 11, 2015, which featured eleven classic rock covers, as well as three original songs (all co-written by Depp). The band made their live debut at The Roxy in Los Angeles on September 16, 2015. Later that same month the group played at the Rock in Rio festival in Brazil. In February 2016, Hollywood Vampires performed at the Grammy Award ceremony as a tribute to Lemmy, who had died at the end of 2015. Later that summer, the band embarked on their first world tour. In 2018, they embarked on another world tour, during which Depp sang David Bowie's "Heroes" as a tribute to the late singer. A settlement was reached in the divorce case on August 16, 2016, which required Heard to receive US$7 million and to dismiss her request for a continued restraining order against Depp. She also dropped her lawsuit against Stanhope. Heard and Depp issued a joint statement indicating that their "relationship was intensely passionate and at times volatile, but always bound by love," adding that neither party "made false accusations for financial gain," and further indicating that there was "never any intent of physical or emotional harm." The divorce was finalized on January 13, 2017. Depp has struggled with alcoholism and addiction for much of his life. Depp has stated that he began smoking at age 12 and began using alcohol and drugs shortly thereafter. In a 1997 interview, Depp acknowledged past abuse of alcohol during the filming of What's Eating Gilbert Grape? In a 2008 interview, Depp stated that he had "'poisoned'" himself with alcohol "'for years'". In 2013, Depp declared that he had stopped drinking alcohol, adding that he "'pretty much got everything [he] could get out of it'"; Depp also said, "'I investigated wine and spirits thoroughly, and they certainly investigated me as well, and we found out that we got along beautifully, but maybe too well.'" Regarding his breakup with longtime partner Vanessa Paradis, Depp said that he "'definitely wasn't going to rely on the drink to ease things or cushion the blow or cushion the situation...[because] that could have been fatal.'" In 2016, then-wife Amber Heard claimed that Depp "'plunged into the depths of paranoia and violence after bingeing on drugs and alcohol,'" although a joint statement issued by Heard and Depp in connection with their divorce denied that either party intended "'physical or emotional harm'" to the other. In 2018, reporter Stephen Rodrick of Rolling Stone wrote that Depp had used hashish in his presence and described Depp as "alternately hilarious, sly and incoherent"; Rodrick also quoted Depp as stating that a claim that he had spent US$30,000 per month on wine was "'insulting'" because he had spent "'far more'" than that amount. In April 2016, Heard appeared in the Southport Magistrates Court and pleaded guilty to falsifying quarantine documents, stating that she was sleep deprived and made a mistake. The two biosecurity charges were dropped, and she was placed on a one-month good behaviour bond, paying an AU$1,000 fine for producing a false document. Heard and Depp also released a video in which they apologized for their behavior and urged people to adhere to the biosecurity laws. The Guardian called the case the "highest profile criminal quarantine case" in Australian history. In March 2016, Depp cut ties with his management company, the Management Group, and accused them of improperly managing his money. The Management Group later sued Depp for unpaid fees and countersued him for damages alleging that Depp was responsible for his own fiscal mismanagement. Depp filed new papers, including receipts from America's Internal Revenue Service (IRS), to have the countersuit dismissed. On July 16, 2018, Deadline reported that Depp and TMG had agreed to settle their lawsuit, and though details of the settlement were not released, both sides were reportedly happy with the outcome. Depp stated to the German magazine Stern in 2003 that "America is dumb, is something like a dumb puppy that has big teeth—that can bite and hurt you, aggressive." Although he later asserted that the magazine misquoted him and his words were taken out of context, Stern stood by its story, as did CNN.com in its coverage of the interview. CNN added his remark that he would like his children "to see America as a toy, a broken toy. Investigate it a little, check it out, get this feeling and then get out." The edition of July 17, 2006 of Newsweek reprinted the "dumb puppy" quotation, verbatim, in the context of a Letter to the Magazine. Depp has also disagreed with subsequent media reports that perceived him as a "European wannabe", saying that he liked the anonymity of living in France while in a relationship with Paradis and his simpler life there. Depp became a U.S. resident again in 2011, because France wanted him to become a permanent resident, which he said would require him to pay income tax in both countries. At the Glastonbury Festival 2017, Depp ranted against U.S. President Donald Trump. Depp controversially asked "When was the last time an actor assassinated a President? ", before adding "I want to clarify: I'm not an actor. I lie for a living. However, it's been awhile and maybe it's time." He then said that he was "not insinuating anything." The comment seemed to reference John Wilkes Booth, the actor who assassinated Abraham Lincoln. Shawn Holtzclaw of the Secret Service told CNN that they were "aware" of Depp's comment, but said, "For security reasons, we cannot discuss specifically nor in general terms the means and methods of how we perform our protective responsibilities". The next day, Depp apologized for making these remarks, saying, "It did not come out as intended, and I intended no malice. I was only trying to amuse, not to harm anyone." In interviews in 2002 and 2011, Depp claimed to have Native American ancestry, stating "I guess I have some Native American somewhere down the line. My great-grandmother was quite a bit of Native American, she grew up Cherokee or maybe Creek Indian. Makes sense in terms of coming from Kentucky, which is rife with Cherokee and Creek Indian." Depp's claims came under scrutiny when Indian Country Today Media Network stated that Depp had never inquired about his heritage nor was he recognized as a member of the Cherokee Nation. This led to criticism from the Native American community, including of his choice to portray Tonto, a Native American character, in The Lone Ranger. ↑ "Top 100 Stars in Leading Roles at the Worldwide Box Office". The Numbers. Retrieved November 4, 2018. ↑ "Charlie and the Chocolate Factory". Box Office Mojo. Archived from the original on July 27, 2013. Retrieved August 21, 2013. ↑ Philiana Ng (May 25, 2016). "Johnny Depp's Mother Dies After Long Illness". Etonline.com. Retrieved March 3, 2017. ↑ The Genealogist, "Richard T. Oren Depp (1879–1912); m. Effie America Palmore. 9th gen. Oren Larimore Depp; m. Violet Grinstead. 10th gen. John Christopher Depp; m. Betty Sue Wells. 11th gen John Christopher Depp II (Johnny Depp), b. 9 June 1963, Owensboro. See Warder Harrison, "Screen Star, Johnny Depp, Has Many Relatives in Ky.", Kentucky Explorer (Jackson, Ky), July–August 1997, 38–39. 247 Barren Co."
1 2 "Ancestry.com". July 23, 2013. Archived from the original on July 23, 2013. Retrieved July 29, 2018. ↑ "'Lone Ranger' stars have roots in historic figures". USA TODAY. Retrieved July 29, 2018. ↑ "Unmasking The Lone Ranger's Leading Men: Finding the Real Life Heroes in Hammer and Depp's Family Trees". Ancestry.com. Archived from the original on July 23, 2013. Retrieved July 14, 2013. ↑ Smith, Kyle (December 13, 1999). "Keeping His Head". People. Archived from the original on June 22, 2012. Retrieved June 19, 2012. ↑ "Sleaze Roxx". ROCK CITY ANGELS. Archived from the original on May 8, 2006. Retrieved July 3, 2006. 1 2 "It's a pirates life for Johnny Depp". Sify. Reuters. July 4, 2006. Retrieved March 23, 2017. ↑ Booth, Michael (September 16, 2010). ""Cry-Baby" Depp makes the girls swoon". Denver Post. Retrieved June 26, 2018. 1 2 3 4 5 "Interview: Johnny Depp". MoviesOnline. Archived from the original on July 5, 2006. Retrieved July 3, 2006. ↑ Cohen, Sandy (June 29, 2006). "Johnny Depp Moving Away From Pirate Role". Fox News. Associated Press. Retrieved March 23, 2017. 1 2 Howell, Peter (June 23, 2006). "Depp thoughts; Reluctant superstar Johnny Depp returns in a Pirates of the Caribbean sequel, but vows success won't stop him from making movies his way". Toronto Star. p. C.01. Retrieved March 23, 2017. ↑ Smith, Sean (June 26, 2006). "A Pirate's Life". Newsweek. Retrieved April 26, 2015. ↑ "Charlie and the Chocolate Factory". Hollywood Foreign Press Association. Archived from the original on December 15, 2009. Retrieved July 25, 2009. ↑ Walker-Mitchell, Donna (July 24, 2009). "Smooth criminal". Melbourne: The Age. Retrieved July 30, 2018. ↑ 'Dark Shadows': Has America fallen out of love with Johnny Depp? ↑ Rosen, Christopher (March 19, 2012). "Johnny Depp '21 Jump Street' Cameo: Inside The Star's Appearance In Big Screen Reboot". moviefone.com. Archived from the original on August 20, 2013. Retrieved August 13, 2013. ↑ Fonseca, Felicia (May 12, 2013). "Disney's Tonto Offensive To Some In Upcoming 'Lone Ranger' Film". Huffington Post. Associated Press. Archived from the original on June 9, 2013. Retrieved June 22, 2013. ↑ Shaw, Lucas (August 6, 2013). "'The Lone Ranger' to Cost Disney $160-$190M in Q4". The Wrap. Retrieved August 7, 2013. ↑ Lieberman, David (August 6, 2013). "Disney Expects To Write Down As Much As $190M For 'Lone Ranger'". Deadline Hollywood. Retrieved August 7, 2013. ↑ "Johnny Depp to Star in Disney Musical 'Into the Woods'". The Hollywood Reporter. April 26, 2013. Retrieved March 3, 2017. ↑ Finke, Nikki (April 26, 2013). "Johnny Depp And Meryl Streep Near Deals For 'Into The Woods' Movie". Deadline. Retrieved March 3, 2017. ↑ Pat Cerasaro (May 10, 2013). "James Corden Joins Streep & Depp In INTO THE WOODS Movie". Broadwayworld.com. Retrieved March 3, 2017. ↑ "Johnny Depp Making Cameo in Amber Heard's Movie London Fields". Movie That Matters. November 7, 2013. Archived from the original on April 8, 2014. Retrieved March 23, 2017. ↑ Sharf, Zack (September 5, 2018). "Amber Heard and 'London Fields' Team End Controversial Legal Battle, Movie to Open After Three-Year Delay". IndieWire. Retrieved November 17, 2018. ↑ Douglas, Edward (November 20, 2016). "Fantastic Beasts Producer David Heyman Explains Why They Cast Johnny Depp". Collider. Retrieved November 20, 2016. ↑ "With Help of Hollywood Make A Film Foundation Grants Film Wish to 16-year-old Fighting Cancer". PRWeb. Retrieved March 16, 2017. ↑ Lincoln, Ross A. (December 3, 2016). "Johnny Depp, Sam Raimi & Others Contribute To Film By 16-Year Old Cancer Patient". Deadline. Retrieved March 16, 2017. ↑ "LA Benefit Premiere of Anthony's Conti's THE BLACK GHIANDOLA – April 22nd". Archived from the original on June 12, 2017. Retrieved June 4, 2018. ↑ "Johnny Depp as Captain Jack Sparrow Pirates of the Caribbean 5". Theage.com.au. August 23, 2012. Retrieved March 3, 2017. ↑ Jr, Mike Fleming (September 29, 2016). "Johnny Depp To Star in 'Murder On The Orient Express' At Fox". Deadline. Retrieved March 13, 2017. ↑ Hipes, Patrick (October 20, 2016). "Josh Gad Boards Fox's 'Murder On The Orient Express'". Deadline. Retrieved March 13, 2017. ↑ "Murder on the Orient Express starts filming". The Knowledge. Retrieved March 13, 2017. ↑ "Kenneth Branagh Directs and Stars in 'Murder on the Orient Express'". The-Leaky-Cauldron.org. January 10, 2017. Retrieved March 15, 2017. ↑ "Murder on the Orient Express - ComingSoon.net". ComingSoon.net. Retrieved March 15, 2017. ↑ "Johnny Depp and More Join Murder on the Orient Express". ComingSoon.net. September 29, 2016. Retrieved March 15, 2017. ↑ "Johnny Depp is going to play a gnome Sherlock Holmes". EW.com. November 6, 2015. Retrieved March 16, 2017. ↑ "Paramount Animation Announces Release Dates - ComingSoon.net". ComingSoon.net. November 10, 2015. Retrieved March 16, 2017. ↑ "Johnny Depp's Notorious B.I.G. Film 'City of Lies' Pulled From Release Schedule". Variety. November 17, 2018. ↑ "[Noir in Festival] Recensione di City of lies - L'ora della verità, con Johnny Depp". Universalmovies.it (in Italian). December 9, 2018. Retrieved December 17, 2018. ↑ Roxborough, Scott (September 12, 2018). "Johnny Depp's 'Richard Says Goodbye' to World Premiere at Zurich Film Festival". The Hollywood Reporter. Retrieved September 12, 2018. ↑ "J.K. Rowling is "genuinely happy" Johnny Depp is in the Fantastic Beasts films. Fans are not". Vox. Archived from the original on December 11, 2017. Retrieved December 12, 2017. ↑ Blumberg, Antonia (December 7, 2017). "J.K. Rowling Defends Johnny Depp's Role In 'Fantastic Beasts'". Huffington Post. Archived from the original on December 12, 2017. Retrieved December 12, 2017. ↑ "'Fantastic Beasts 2' Production Date Set For Late Summer". Archived from the original on March 17, 2017. Retrieved March 23, 2017. ↑ "Johnny Depp Cast In The Invisible Man Remake At Universal". Screenrant.com. July 1, 1927. Retrieved March 3, 2017. ↑ "'The Mummy' Reviews: What the Critics Are Saying". Variety. June 8, 2017. Archived from the original on June 7, 2017. ↑ "Universal's 'Monsterverse' in Peril as Top Producers Exit (Exclusive)". The Hollywood Reporter. Eldridge Industries. November 8, 2017. ↑ Fleming, Mike Jr. (March 27, 2017). "Johnny Depp, Natalie Portman Drive Tempting Packages As Strike Talk Looms". Deadline.com. Archived from the original on March 28, 2017. Retrieved April 23, 2017. ↑ "Johnny Depp on 'The Crimes of Grindelwald' and His Most Iconic Roles". Collider. October 9, 2018. Retrieved November 17, 2018. ↑ Lieberman, David (October 15, 2014). "Warner Bros' Kevin Tsujihara Outlines Major Film & TV Push Amid Cost Cuts: Time Warner Investor Day". Deadline Hollywood. Archived from the original on November 9, 2016. Retrieved November 17, 2016. ↑ Barraclough, Leo (August 3, 2016). "'Fantastic Beasts' Sequel in the Works With J.K. Rowling and David Yates, Release Date Set". Variety. Archived from the original on November 5, 2016. Retrieved November 17, 2016. ↑ "Johnny Depp to Play War Photographer W. Eugene Smith in 'Minamata'". Variety (United States edition). Variety. Retrieved January 6, 2019. ↑ Marc Graser and Dave McNary (12 July 2013). "Johnny Depp Moves Production Company to Disney". Variety. ↑ Andreeva, Nellie (April 28, 2016). "Johnny Depp-Produced 'Muscle Shoals' Among 5 Series In Works At IM Global TV". Deadline. ↑ "he Guests on 'The Manhattan Blues Project'". Archived from the original on October 31, 2013. Retrieved May 17, 2013. 1 2 "Alice Cooper, Johnny Depp, Joe Perry Supergroup Announce First Live Dates". RTTNews. ↑ "Grammys: Taylor Swift wins album of the year". BBC News Online. February 16, 2016. Retrieved February 16, 2016. ↑ "HOLLYWOOD VAMPIRES ANNOUNCE 2016 TOURING". Loudwire. April 3, 2016. Retrieved October 14, 2018. ↑ "HOLLYWOOD VAMPIRES ANNOUNCE 2018 TOUR DATES". Loudwire. March 28, 2018. Retrieved October 14, 2018. ↑ "Watch Hollywood Vampires' Johnny Depp Sing David Bowie". Loudwire. Retrieved May 30, 2018. ↑ "Man Ray | Bar/Club Review | Paris". Frommer's. Archived from the original on May 1, 2008. Retrieved March 23, 2017. ↑ Saad, Nardine (January 17, 2014). "Johnny Depp and Amber Heard spark engagement rumors". The Los Angeles Times. Retrieved August 20, 2016. 1 2 3 4 "Amber Heard and Johnny Depp's court declarations regarding allegations of domestic violence". The Los Angeles Times. May 27, 2016. Retrieved August 20, 2016. ↑ Bitran, Tara (June 21, 2018). "The Most Shocking Revelations From Johnny Depp's Rolling Stone Interview". Variety. Retrieved June 21, 2018. ↑ Mandell, Andrea (May 25, 2016). "Amber Heard Files for Divorce from Johnny Depp". People. USA Today. Archived from the original on May 26, 2016. Retrieved May 25, 2016. ↑ Miller, Julie (May 25, 2016). "Report: Amber Heard Files for Divorce from Johnny Depp After 15-Month Marriage". Hollywood. Vanity Fair. Archived from the original on May 26, 2016. Retrieved May 25, 2016. ↑ Ahmed, Tufayel (June 15, 2016). "Amber Heard Drops Spousal Support Request in Johnny Depp Divorce". Culture. Newsweek. Archived from the original on June 19, 2016. Retrieved June 19, 2016. ↑ Woolf, Nicky (May 28, 2016). "Amber Heard Granted Domestic Violence Restraining Order Against Johnny Depp". The Guardian. Retrieved May 27, 2016. ↑ Kimble, Lindsay (June 7, 2016). "Drinking, Drugs and 'Hillbilly Rage': Johnny Depp's Own Words About His Troubled Past". The Guardian. Retrieved June 26, 2018. ↑ Sinha-Roy, Piya (January 13, 2017). "Actors Johnny Depp, Amber Heard finalize bitter divorce". Reuters. Retrieved June 25, 2018. 1 2 3 "Amber Heard To Give $7M Johnny Depp Divorce Settlement To Charity". The New York Times. August 19, 2016. Retrieved August 20, 2016. ↑ Oppenheim, Maya (September 7, 2016). "Amber Heard drops defamation lawsuit against Johnny Depp's friend and comedian Doug Stanhope". The Independent. Retrieved December 19, 2016. ↑ "Actors Johnny Depp, Amber Heard finalize bitter divorce". Reuters. January 14, 2017. Retrieved March 11, 2017. 1 2 3 Kimble, Lindsay (June 7, 2016). "Drinking, Drugs and 'Hillbilly Rage': Johnny Depp's Own Words About His Troubled Past". People.com. Retrieved June 26, 2018. 1 2 "Johnny Depp And Alcohol: Actor Reveals 'I Don't Have The Physical Need For The Drug'". Huffington Post. June 20, 2013. Retrieved June 26, 2018. ↑ Allen, Nick (May 28, 2016). "Johnny Depp became 'delusional and aggressive' after bingeing on drugs and alcohol, says Amber Heard". Telegraph.co.uk. Retrieved June 26, 2018. ↑ Rodrick, Stephen (June 21, 2018). "The Trouble With Johnny Depp". Rolling Stone. Retrieved June 26, 2018. ↑ "Teen heart-throb Johnny Depp, who plays an undercover policeman..." UPI. March 9, 1989. Retrieved December 19, 2016. ↑ Brozan, Nadine (September 14, 1994). "Chronicle". The New York Times. Retrieved December 19, 2016. ↑ "Medical professor sues Johnny Depp over alleged bodyguard assault". Rawstory.com. October 29, 2012. Retrieved March 3, 2017. ↑ "Johnny Depp Settles Up In 'Concert Brawl' Lawsuit". TMZ. January 3, 2014. Retrieved December 24, 2018. ↑ "Johnny Depp's dogs face death in Australia". BBC News. May 14, 2015. Retrieved April 18, 2016. ↑ National (November 23, 2013). "New rules to bring quick release from quarantine for imported pets". Smh.com.au. Retrieved March 3, 2017. ↑ "Amber Heard charged with illegally bringing dogs to Australia". The Guardian. July 16, 2015. Retrieved April 18, 2016. ↑ "Johnny Depp's dogs face death in Australia". BBC News. May 14, 2015. Retrieved May 26, 2015. ↑ Pulver, Andrew (September 4, 2015). "Johnny Depp: 'I killed my dogs and ate them'". The Guardian. London. Retrieved March 17, 2016. ↑ "Johnny Depp's dogs: Amber Heard pleads guilty over Boo and Pistol quarantine document". ABC News. Australian Broadcasting Corporation. April 18, 2016. Retrieved April 18, 2016. 1 2 3 Joshua Robertson. "Charges dropped against Amber Heard for bringing dogs to Australia with Johnny Depp". the Guardian. Retrieved April 18, 2016. ↑ Schliebs, Mark (April 18, 2016). "Johnny Depp, Amber Heard at court hearing over dogs Pistol and Boo". The Australian. Retrieved April 18, 2016. ↑ Schwartzel, Erich; Fritz, Ben; Patterson, Scott (January 13, 2017). "Johnny Depp Sues Business Managers, Accuses Them of Fraud". The Wall Street Journal. Retrieved March 23, 2017. ↑ Ashley Cullins (January 31, 2017). "Johnny Depp Lives $2M-a-Month Lifestyle, Claim Ex-Managers in Lawsuit". The Hollywood Reporter. Retrieved March 3, 2017. ↑ "Johnny Depp blames years of tax problems on ex-managers". Film-News.co.uk. February 23, 2017. Retrieved March 23, 2017. ↑ "Johnny Depp & Ex-Biz Managers Settle $25M Fraud Suit A Month Before Trial". deadline.com. July 16, 2018. Retrieved July 18, 2018. ↑ "Depp 'punched crew member in drunken tirade'". BBC News. July 10, 2018. Retrieved July 10, 2018. ↑ "CNN.com - Transcripts". Transcripts.cnn.com. October 16, 2011. Retrieved March 3, 2017. ↑ "Johnny Depp Supports Ukrainian Director Oleg Sentsov in "Imprisoned for Art" Campaign". hollywoodreporter.com. November 17, 2016. Retrieved February 18, 2019. ↑ Stedman, Alex (June 23, 2017). "Johnny Depp Apologizes for Donald Trump Assassination Joke". Variety. Retrieved June 24, 2017. ↑ Breznican, Anthony (May 8, 2011). "Johnny Depp on 'The Lone Ranger'". Entertainment Weekly. Retrieved August 8, 2011. 1 2 "Disney Exploiting Confusion About Whether Depp Has Indian Blood". June 17, 2013. Archived from the original on July 5, 2013. Retrieved August 13, 2013. ↑ "Is 'Tonto's Giant Nuts' a Good Name for Johnny Depp's Band?". Indian Country Today Media Network. May 22, 2013. Archived from the original on May 24, 2013. Retrieved May 25, 2013. 1 2 ICTMN Staff (June 12, 2013). "Tito Ybarra Greets Indian Country as 'Phat Johnny Depp'". Indian Country Today Media Network. Archived from the original on July 25, 2014. Retrieved February 4, 2014. ↑ Gornstein, Leslie (May 23, 2012). "Why Can Johnny Depp Play Tonto, but Ashton Kutcher and Sacha Baron Cohen Get Slammed?". E! Online. Archived from the original on 2010-05-25. Retrieved 2019-02-22. ↑ Steve Leggett (February 19, 2013). "Son of Rogues Gallery: Pirate Ballads, Sea Songs & Chanteys - Various Artists | Songs, Reviews, Credits". AllMusic. Retrieved March 3, 2017.